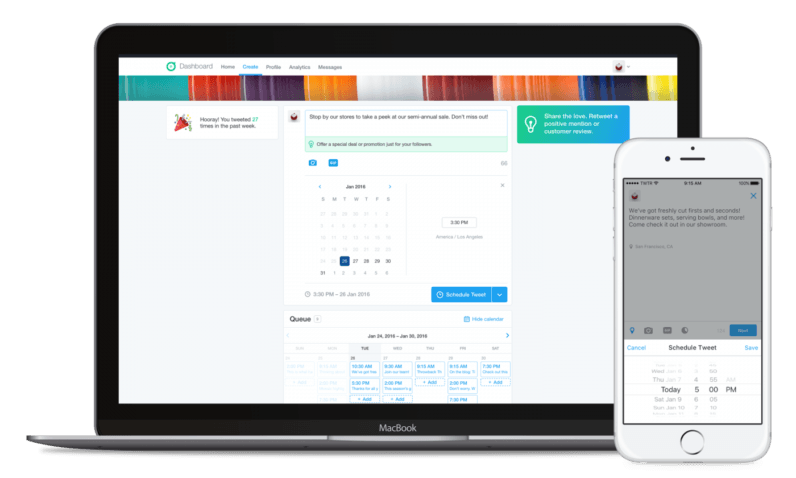 Twitter is giving businesses a nod today with a new Dashboard app for the Web and iOS. From there, businesses can see what people are saying about them, schedule tweets, or view audience insights. It’s for businesses what Engage is for influencers. First up, businesses can create a tailored feed to view tweets related to their business. This includes more than just @mentions; you can view things such as questions aimed at your business or tweets about related products, helping you engage with potential customers. During the initial set up process, you’ll be able to select or type words related to your business (or words to exclude), including nicknames, people and hashtags you might want to read about. It’s a simple but useful set of filters. In fact, I wish I were able to set similar filters for personal twitter feeds, as there are numerous topics I’d want to see in my feed without actually following specific accounts. Speaking of engaging, the app also provides business owners for inspiration on things they can tweet about. You might get a tip suggesting you share a photo of your employees, for instance, or to retweet a positive testimonial from a customer. Finally, the dashboard also includes a calendar so you can schedule tweets, direct messaging feature for one-to-one exchanges, and an overview of your analytics performance. Chances are larger businesses are already using other tools for managing business insights. As such, Twitter probably sees the tool being used by smaller businesses, newer businesses, who will appreciate having a free, easy to use option. The aforementioned tweet suggestions are also a simple way of onboarding businesses into using the platform more, especially for owners with little social media experience who might not know how to start interacting with audiences. The Twitter dashboard is available on the Web at dashboard.twitter.com or on iOS on the App Store. Sorry team Android, no app for you yet.